We first met Yemi Amu at the Healthyish Homecoming produced by Bon Appétit. She was on an amazing panel called “Why Food Sovereignty Matters”. On the panel she discussed how access to food should not be a burden and how her daily work provides information and access. Since that conversation, Yemi has been on our radar as we are always excited to connect with local Black/POC farmers working on food justice in urban communities. However, we were even more excited to connect with Yemi because her farm doesn’t utilize soil! 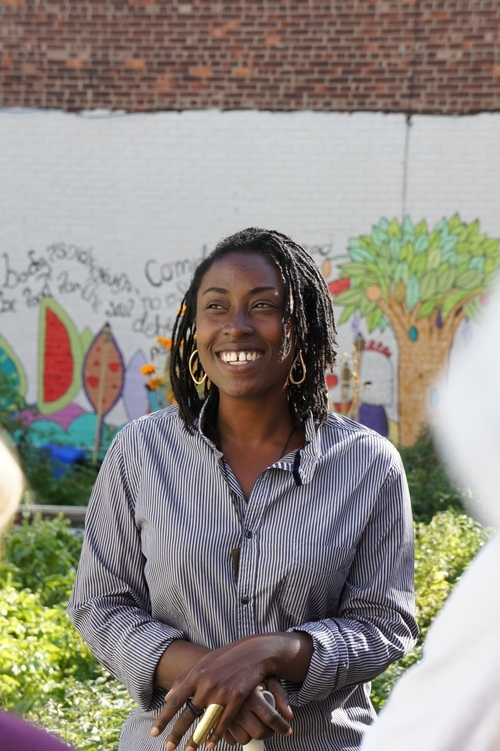 She is the founder of OKO FARMS, which is an aquaponic farm situated on a Bushwick city lot - “Green Thumb Garden”. The site is mainly used for educational purposes - where 80% of the produce they grow goes towards education and rest they sell to people in the neighborhood, local restaurants and farm shares. 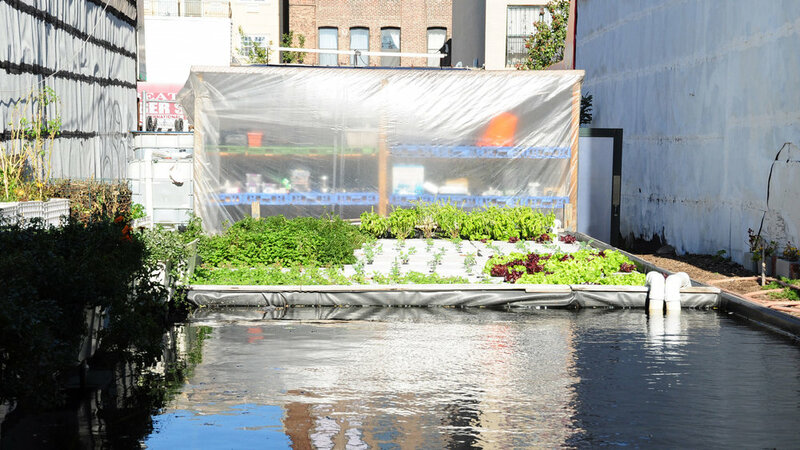 BUT what exactly is aquaponics? Born and raised in Nigeria, Yemi shares that her mom was an avid gardener. Although she didn’t participate as a kid, she was always surrounded by it, which indirectly sparked her interest in farming. When she moved to the states, she focused on nutrition and nutrition education - studied Ayurveda - Indian holistic health. In graduate school, she studied nutrition behavior modification. “Helping people understand the barriers of healthy dietary and lifestyle habits and figuring out how to get around those barriers”, became a passion of hers. She has worked with a lot of people who were low income and later worked with an organization that had a housing facility for formally homeless/ mentally ill adults. Yemi undeniably is a visionary. She grew a kitchen garden on the roof at her job - primarily growing vegetables that they were familiar with. She discovered aquaponics in that process where one of the volunteers suggested this system for growing food where she can also raise fish for her clients. YES - in an urban environment. “Obsessed with the way food is grown”, Yemi has been farming full time for a long time. Amongst other things, she grew food for a food pantry for several years and ran the farmers market and youth program at Weeksville Heritage Center. After starting her aquaponics garden about 2 years ago, she saw that residents began changing their diets to more plant based and this is largely because she’s able to teach people about the food system. The truly beautiful thing about Yemi’s farm is that so much of what she does is for educational purposes - she’s really passionate about sharing her knowledge. “If you want to be able to talk about farm raised fish, people need to be able to experience it”, says Yemi. The edible fish she uses are channel catfish and blue gill (native fish to the north east). She shares that she doesn’t farm talapia because it can only survive in tropical climates. Tilapia is the biggest farm fish and the oldest (talapia and carte). It blew my mind when she shared that talapia was being farmed in the Nile like 400 BC and the Chinese were farming a version of Channel catfish and carpe. Tilapia originated in the Nile! As we dove deeper into conversation of meat and seafood. Yemi’s greatest advice when it comes to consumption of meat is “Know the source”. It doesn’t matter if it’s beef, chicken or fish … if you don’t know where it’s coming from - it’s all the same. What matters are the values of the person who are raising the animals. When it comes to fish - it’s very difficult to trace the supply chain. You don’t know where your fish is coming from. Even retailers can’t tell you exactly who the farmer is who raised your fish. The answer is not being vegan. The answer is to participate in how food is being grown. It’s not about veganism. Because most people who are swapping to veganism still don’t think about the relationship to the land, what impact almond milk has - growing almonds at that rate. It takes 5 gallons of water to get one almond. First you have to learn about nature. We’re so distant from nature - we have to understand what it takes to actually grow food. And understand how ecosystems works and then demand better from people who grow food. Also policy makers. If they’re not supporting the people who grow your food, who make huge sacrifices to grow your food ... then who will? We need to be in the world differently!